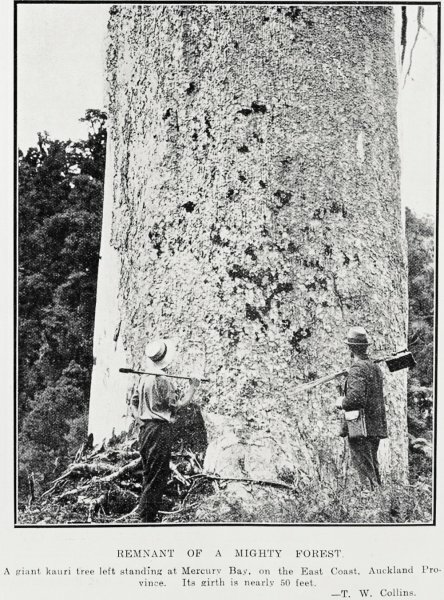 After the loss of the giant trees of the Northern Wairoa at Kaihu, Tokatoka and the 40 Acre Bush in the first decade of the 20th Century, and before the announcement of the Waipoua giants in the 1920s, a forgotten kauri tree at Egan’s Creek, just out of Whitianga, was known as the largest (by girth anyway) kauri tree in New Zealand. 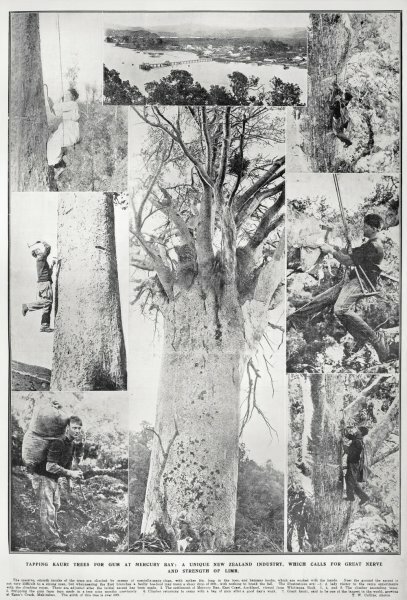 The tree was only slightly smaller than Te Matua Ngahere, described as having a 50 ft (15.2 m) girth, a short stumpy 36 ft (11 m) bole to go with a “an extraordinarily heavy head, the thick limbs rising to an unusual height”. The tree was in poor health at the time it was photographed by Tudor Collins for the Auckland Weekly News in 1923. The owner of the land the tree stood upon was absent serving in World War One, when a burn off on neighbouring land scorched the tree at that time. Formerly standing just off the main road between Mercury Bay and Coromandel, now known as the 309 Road, there is no further record of the tree past the 1920s. Egan’s Creek is now the location of a small, picturesque camp ground straddling the creek as it flows down the banks of the Mahakirau River. The Egan’s Creek kauri was not the only large tree in the area. Only some 1.5 km to the south up a neighbouring ridgeline was McIssacs Kauri, one of the largest in the peninsula, but somewhat smaller than the Egan’s creek tree. Having escaped felling due to its precipitous location, McIssacs was reported to be in very poor health in the 1980s . Recent satellite imagery suggests that it fell, either dead or dying, sometime between 2010 and 2013, at which time the trunk of the tree can be seen lying at the base of a small slip. “Giant Kauri Trees,” New Zealand Herald, 22 August 1923. E. V. Sale, The Quest for the Kauri, Reed, 1978. J. Halkett and E. V. Sale, The World of the Kauri, Reed, 1986. Was suffering effects of fire when documented. The tree was described as being just off the main road between Mercury Bay and Coromandel at the time. That road is now the 309 Road, and is far from a main highway, being tight and unsealed.